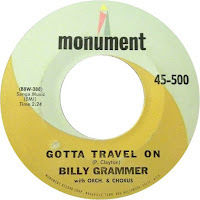 1) In this song, the Billy Grammer sings that "summer's almost gone, winter's coming on." When you look out your window, do you see any evidence that the seasons are changing? There are a few dead leaves here and there, but for the most part the grass is green and so are the trees and still hot, although it is supposed to be cooler next week. I am hoping. 2) He admits he has laid around and played around for too long. Do you consider lazy days to be wasted days? not at all, I rarely completely waste a day though. Even my lazy days are productive, I bet most people would say that. It is hard for me to sit still very long. 3) Billy relaxed by fishing. Tell us about a visit you made to a pier, or a ride you took on a boat, this past year. (Bonus points if you went fishing!) I haven't been fishing or boating in years and I live near a lake. I saw Phantom of the Opera! Does that count? It is not really out in nature, I went to a baseball game too. 4) Born in 1925, Mr. Grammer was the eldest of 13 children. He and his wife Ruth were childless. What do you think is the ideal size for a family? I think if I had not had trouble after delivery (I had seizures) I would have had one more. So two kids. 5) This song was very popular on juke boxes back in 1959. When were you last in a bar or restaurant that had a juke box? Did you play it? I remember a bar when I was in college that had a juke box and yes, I played it! I love juke boxes. That was in 1992 or so. 6) In 1959, movie tickets zoomed up in price to $1.00 and Ben Hur was the big blockbuster. What's the last movie you saw in a theater? Do you remember how much the ticket cost? We haven't been to the theater in a while, so I am thinking the movie was Beauty and the Beast...the one with people a couple of years ago. I can't remember ticket prices, but they are ridiculous...another reason we do not go very often. 7) Huckleberry Hound was a hit with the younger audience in 1959. What cartoon did you enjoy as a kid? Smurfs and Looney Toons! 8) In 1959, continuing dramas (soap operas) were still broadcast each day on the radio. When you turn on the radio, do you listen for talk, news, or music? mostly music, occasionally a baseball or football game if I am driving and every so often talk radio. I like John Tesh, Intelligence for Your Life. I used to listen to Focus on the Family. 9) Random question -- Which competition would you rather judge: The Pillsbury Bake Off, The Miss America Pageant, or Dancing with the Stars? Pillsbury Bake Off so I could taste the yummies! I would not want to judge any of these though, I am better at vocals, so I am better suited for The Voice. I always enjoyed listening to Focus on the Family. Dr. Dobson is so wise. Movie ticket prices are ridiculous, so we don't go often either. I have to really want to see something to go to the theater. I chose the Pillsbury Bake Off, too. You are right about not having truly lazy days....Lazy days here are reading and knitting days. So, fairly productive. But, there is no housework unless it's a load or two of laundry. Happy Weekend Lori! We are suppose to cool off too next week. I am not ready for it. Oh, my goodness, haven't thought about The Smurf's in a very long time. My kids use to watch that. And, I have listened to more episodes of Focus on the Family than the law allows. I LOVE James Dobson. And, I can hardly wait for The Voice season to start. Happy weekend! Movies at the theater are so darned expensive! We didn't take our kids very often because of how much it cost to buy tickets and popcorn and all. Usually, we went over their Christmas break from school as a special treat. Now that it's just the two of us, we go a little more often but not a lot. Enjoy the rest of your weekend!